Last weekend's snowfall put road crews to work plowing and salting streets throughout Hamilton County. Now, as weather forecasts show the potential for more snow this weekend, some road crew equipment is in need of a little TLC. In Mason, crews spent much of Tuesday replacing broken snow plow blades damaged from last weekend's heavy workload. CINCINNATI — Winter is here. The weekend's snowfall put road crews to work plowing and salting streets throughout Hamilton County. Now, as weather forecasts show the potential for more snow ahead, some road crew equipment is in need of a little TLC. In Mason, crews spent much of Tuesday replacing broken snow plow blades damaged from last weekend's heavy workload. They have 18 snow plows housed in the service center, and where the snow plows get stored in down time has had a significant impact on their longevity. "Because we store the trucks inside here we don't have as many breakdowns as we used to," said David Riggs, public works director for the City of Mason. "We used to have everything outside and you would have a lot of trucks that would just malfunction." He said storing the trucks indoors gives them a greater chance to hopefully keep the trucks for about 15 years. Another issue to tackle that's crucial to preserving the equipment is, ironically, washing all the salt off the vehicles. "You want to get the salt off the vehicles if at all possible," said Ted Hubbard, Hamilton County engineer. "We'd like to get 20 years out of these vehicles if at all possible." Hubbard said it's common from trucks to become damaged or experience mechanical breakdowns during winter weather runs. It's just important to stay on top of the damages, fix things as soon as possible, and get them back on the roads. 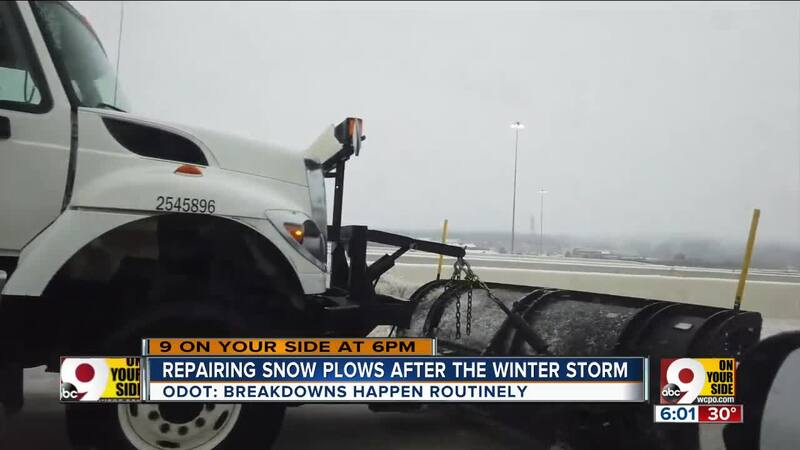 The Ohio Department of Transportation is consistently flghting the battle against broken equipment as well, and they have to work just as hard to ensure things get fixed quickly. However, after a rough weekend like this past one, ODOT also has to be sure their workers are ready to go too. Spokesperson for ODOT district 8, Brian Cunningham, says personnel recovery is also important. "The folks that are driving the trucks were working 12-hour shifts," he said. "So some of that will be reflected this week. But also our mechanics are making sure the trucks are ready to roll when they're needed." 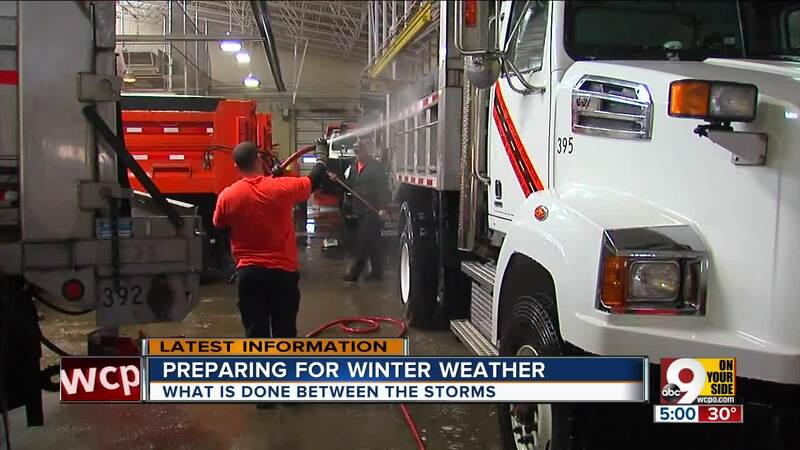 ODOT has 150 trucks in District 8, which covers all of Southwest Ohio, and while a few may still need some care before this weekend, they'll still have plenty of trucks running and on the roads.